So your precious child has been admitted to nursery and as she or he takes the first steps towards independence, you as a parent must naturally seem very concerned and eager to ensure that it is a smooth transition for the child. Here are a few tips from an experienced nursery teacher. Ms. Naseem from Trio World School has more than ten years experience, and these tips will definitely help every anxious parent as their tiny tots navigate the journey from home to school. While bringing your children into the school campus, always lead the child by hand by your side. This develops more independence and more confidence in the child. When you hold the child in your arms or communicate over possessiveness, the child will find the transition very difficult. Calm down and trust the teacher and the institution. You would have enrolled your child in only after checking the credentials of the institution and believing in the institution’s capabilities. It takes a minimum of 2 – 3 months for the child to fully settle in. Only after that period does learning set in. Therefore the instructions for early years are very different from that of higher classes. Trust that. Don’t disrespect the teacher. Remember she is a human being and has under her care a minimum of at least 20 children. Respect her time and that the same way your child is important to her, the other children are equally important to her. A teaching methodology designed for children is set up after due consideration and planning. It is not something that can be explained to you in 5 or 10 minutes. Trust the learning methodology at work and wait patiently for results in your child. Each child has his/her own learning curve. At home reinforce the learnings in the classroom by talking about it and encouraging the child. This will greatly aid in the child’s learning curve. Provide play dough, physical & outdoor activities which develop social skills & cognitive learning in the child. This prepares the child for school in Bangalore. At home, encourage the child to eat on his/her own with a spoon. Even if it is messy don’t look for an easier option to feed. This will encourage good eating habits in the child and you don’t need to be overtly anxious if your child is eating in school. Your child’s teacher and you are on the same page – always remember that. At Trio World School we offer an individual education for each student. The TWS curriculum combines extra-curricular interests and sports with a wide range of academic studies to develop a personal programme. This personal combination of studies is overseen by Head of the School, that ensure that any of the inevitable clashes of interest are addressed and that extra time rehearsing for Hamlet doesn't mean Math's homework is no longer important! We expect a lot from our students: each academic subject sets homework to be completed before the next lesson, so pupils soon learn the skills of time management and prioritising that will give them the self-confidence and independence required at university and beyond. The week runs from Monday to Friday from 8am to 3.30pm with 6, 50-minute periods each day plus. All students have two scheduled afternoons of sports a week. In High School, homework is set for every school day and should take about one and a half hours not including private study for their examination subjects. Students in the Middle School are expected to spend at least three hours a week on homework. Primary school students will be given a minimum of 20 minutes homework thrice weekly. Parents of Infant students are actively encouraged to help with colouring pictures, learning new words and writing letters and counting as often as possible. In most schools extra-curricular activities run hand-in-hand with academics these days. What started out tentatively as one odd dance or music or theatre class conducted after school hours has now been integrated into the school time table in very many schools. However one thing has still not changed. By and large schools still consider such activities as ‘extra-curricular’ in nature. 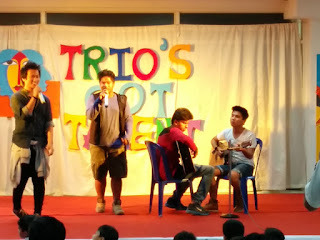 True they are extra-curricular, but our experience in Trio World School is that they accrue tremendous benefits to the emotional well-being and growth of the student which ultimately is what education is all about. Any activity that fosters a sense of team spirit, mutual respect, emotional maturity, emotional strength, humility, right values, emotional growth and the ability to transcend and overcome challenges is after all the ultimate goal of education. These are the essential soft skills that students will take forward in their lives. This will be the basis of their persona – what they project to the outside world and the basis of their lives. Class room teaching no matter how advanced or how inclusive, cannot only be the basis of knowledge dispersal. Learning must happen through various sources in unexpected places – like the football ground, when the student least expects! At Trio World School we have seen how theatre has helped very many children develop emotional stability and growth. Through specialised theatre games, a deeper sense of harmony, bonding, better confidence, improved communication skills, reduced stress levels and a better self-esteem in participants is visible. The theatre has achieved much because it evokes the child-like state in participants and addresses deep rooted issues through play. Very many institutions today have theatre as an extra-curricular activity but don’t probably realize that for many students it is a potential life-saver. For most, it is only a hobby that students can pursue, but for the avid participant it can be his universe. So what has she learnt from that experience? “I miss choir now that I am passing out of school, but it made me a better person. It taught me about hard work and responsibility and how that eventually pays off in the end. It taught me to maintain a balance between fun and seriousness. Being a part of the choir also proved that if you do what you love somehow it will work out for you and if you are passionate about your work it will show and people will recognize it.” She is misty-eyed as she signs off. Finding a common deeper co-relation in the outcomes of two diverse forms like theatre and choir singing is particularly fascinating. What is even more fascinating is when the institution can bring them as an added aid in education and not leave them to their own devices. Can that be done? Of course it can and that is what we at Trio World School have been aiming at. To illustrate with an example we take you to our football field. Now P.E Education is just an extra-curricular activity everywhere else, but not at Trio. Avinash Kumar the Head of our P.E department has a work experience of eleven years. Avinash believes that the corner stone of physical education is ‘skill, fitness and life skills’. Life-skills? Let him explain. “Sports develop trust, honesty, the need to follow rules and regulations...It is a medium where we learn life skills along with sports skills. Students learn discipline. They learn how to cope with situations. It brings out the fighting spirit in students and they also learn to help each other. Take any sport, for instance football. Without any of these skills, one cannot be a good football player” he avers. Avinash shares one specific example where Physical Education class go hand in hand with academics to make a difference to a student. He gives the example of a student who had severe behavioural issues. When this was noticed, the teacher tried to address the issue in the classroom. When it was found that different approaches had their limitations, she tried to understand the student’s areas of interest. It was found that the student had a keen interest in football. Keeping this in mind, the teacher consulted with Avinash about the best re-course to deal with this situation. Avinash’s approach was a two-pronged strategy. One was to counsel the student and to devise a sports based approach to help the child deal with situations. He found that the child was facing personal issues at home and was unable to cope with it leading to behavioural challenges in school. He then devised a sports-based strategy which focused on developing life-skills to cope with the child’s personal challenges. Corrective approaches were built into the sports approach. If aggression was exhibited on the sports field, a time-out was given to enable the student to reflect on the behaviour. Thus with a guided approach in a span of three – five months the student was better able to deal with personal issues. Needless to say the student turned out to be a well-balanced and mature individual with no residue of the previous disturbing behaviour. 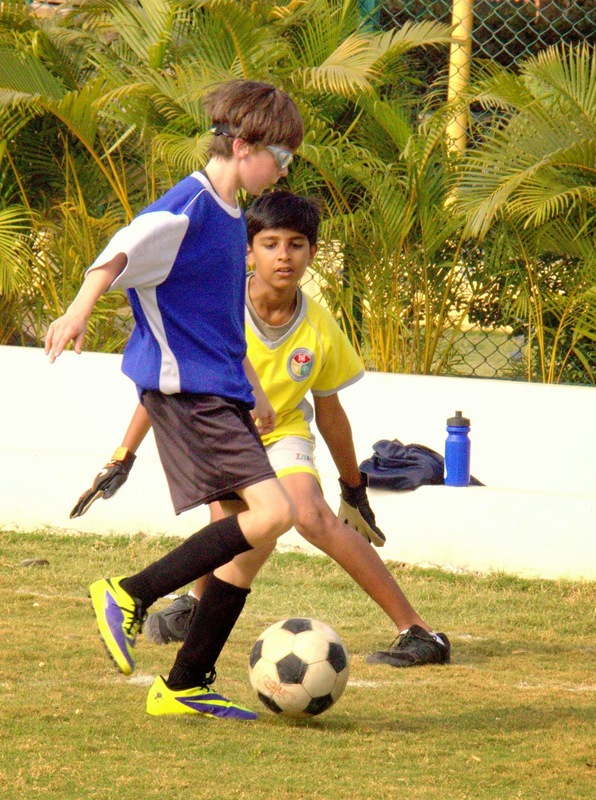 At Trio World School similarly Physical Education classes have been used to help deal with conditions like dyslexia, ADHD (Attention Deficit Hyperactivity Syndrome) and Autism. In all these cases, sports have played a remarkable role in developing life skills in students. In a fast paced world with numerous challenges, we need all the help we can to make education truly work. It is the need of the hour to use extra-curricular activities in schools not only as an add-on but to be able to be integrated well with education. When done so, it can complement educational, emotional, and psycho-social needs of children.